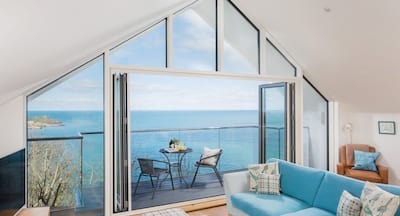 Set high above the iconic views of St Ives, Ocean View offers a superb luxury base for your family and friends holiday escapes on the Cornish coast. Four boutique bedrooms, light and lofty open plan social spaces and jackpot views set the scene for a very special stay whatever the occasion. 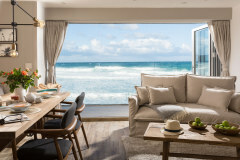 This inspiring house has been thoughtfully styled to create beautiful focal points, ensure a relaxing ambience and capture the coastal colours. 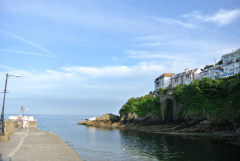 The cosmopolitan harbour of St Ives is a short walk away and offers a host of adventures whatever the age range of your party, from the young to the young at heart. 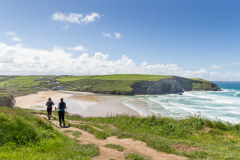 Wile away your days on Porthminster Beach, Porthmeor Beach or Carbis Bay, walk the coastal paths from your holiday door and simply soak up the Cornish way of life. Ocean View is a mid-terrace split level townhouse set on the front row of The View, a recently created development of luxury home from homes. The entrance is set on the first floor, lead into a large central hallway and immediately sink into your holiday heaven. The indulgence of bedrooms one and two and separate cloakroom complete the first floor before ascending to the penthouse level. 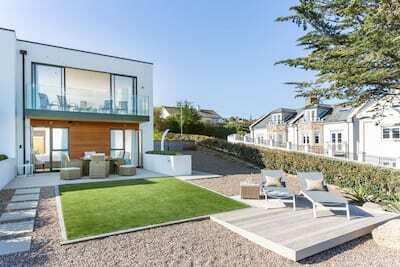 High above the seas, the open plan layout is flooded with natural light from the tri-fold doors. The dining table is perfectly placed for guests to catch up over good food and conversation, slide back the glass doors for a unique al fresco dining experience. From lazy Sundays to busy Saturdays, the living room offers a versatile space for the comings and goings of holiday life. Relax into the luxury sofas with a good book or pop on your favourite film. The ship shape kitchen has all you could need and presents a slick modern workspace in which to get creative with Cornwall's finest of fare. Heading back down the stairs, continue to the ground floor where bedrooms three and four offer a flexible option of twin or double rooms. Each bedroom has been personally styled from warm mustard yellows to cool coastal blues. The contemporary bathroom is perfect for a soak after busy holiday days. 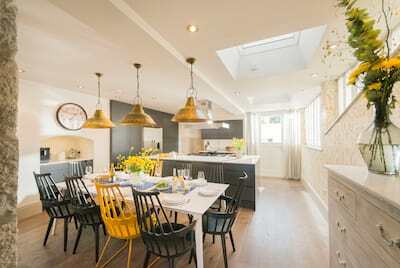 Throughout Ocean View, picture perfect Cornish scenes adorn the walls offering itinerary inspiration from the wild waves of Watergate Bay to the characterful landmark of St Michael's Mount. 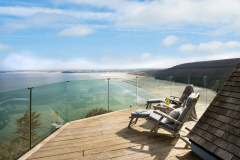 Let the salty Cornish air in as you slide back the tri-fold doors of the penthouse level! From the sunrise to the sunsets, gaze upon the changing lights of St Ives and bustling boat life. A bistro style table and chairs welcomes morning coffee and Cornish cocktails. The ground floor bedrooms enjoy a communal lower terrace with relaxed seating for that 'away from it all' couple of hours with a magazine just-for-you. 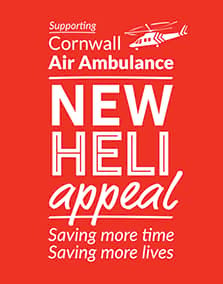 A 5 minute walk down the hill and you'll find yourselves in the St Ives mix. 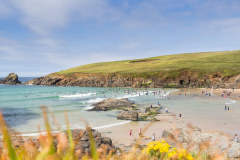 Head for a local ale, pack up a beach picnic, explore the galleries, shop to your hearts content or simply stop a while and soak up the atmosphere - Cornwall has never looked so good! 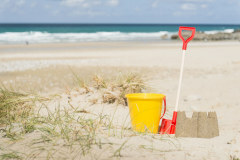 Children will adore the holiday door to sandy shore convenience and with a plethora of sandy beaches to choose from, you can try a new one every day. Sheltered clear waters make water sports a dream be it kayaking, paddle-boarding or body boarding your water babies will dive right in. 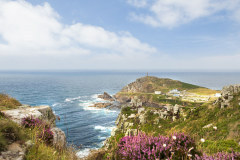 St Ives has plenty of mouth watering places to dine from cafes to fine dining. 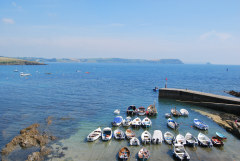 With your allocated parking, it is easy to escape for the day and explore even more of this stunning county. Choose fom 4 beautiful boutique bedrooms set across the first and ground floors. From the parking space there is one step down and then three steps up to the front door. Level access onto the upper balcony. The lower terrace is accessed via the ground floor bedrooms. Ocean View is set over 3 floors with the entrance on the 1st floor. There are 2 internal flights of stairs with handrails. 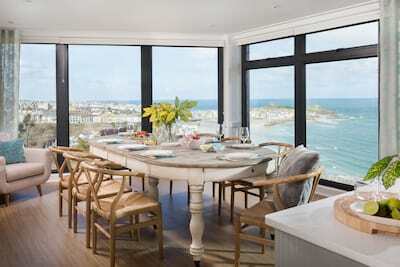 The property has excellent views over the bay of St Ives.